After the battle of Freeman’s farm, Burgoyne, running low on men and food, was still in a very difficult position, but decided to wait in the hope that Clinton would arrive to join his army. While in the Continental camp resentment between Horatio Gates and Benedict Arnold finally exploded into open hostility. Arnold asked for a transfer to Washington’s command, which Gates granted, but instead of leaving he remained in camp. 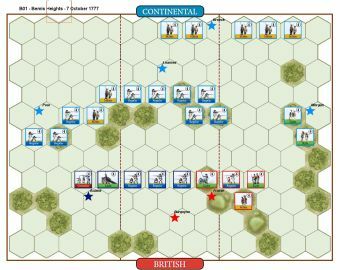 In early October, Burgoyne decided to again reconnoiter the American left flank sending Fraser’s Advanced Corps forward to see if an attack was possible. Fraser advanced about three quarters of a mile to a rise above Mill Brook, where he stopped to observe the American position. When Continental scouts brought news of Burgoyne’s movement to Gates, he immediately ordered Morgan and Poor’s command to engage the enemy supported by Broeck’s large militia brigade. The British force broke and retreated back toward their entrenchments, when Fraser was mortally wounded. The stage is set. The battle lines are drawn and you are in command. The rest is history? • Opening Cannonade rules are in effect. A tough one for the British. The Americans won 6-2 with Hessian left over run and then the British line rolled up. 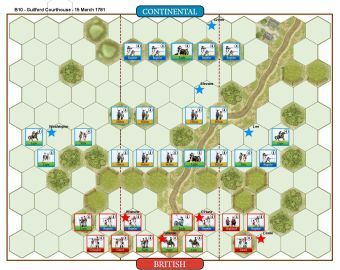 The British Lights tried hard and got the American lights out of the woods with General Fraser leading the way but the Militia stabilised this breakthrough and shot it to pieces. A couple of decent games had with this scenario, the first a close-run 7-5 win to the Americans and the second a 7-3 win to the British. The first game had the Americans leap to a 4-0 advantage and with the Hessian artillery and British Light Infantry unexpectedly routing whilst at full strength - what are odds?!!!! 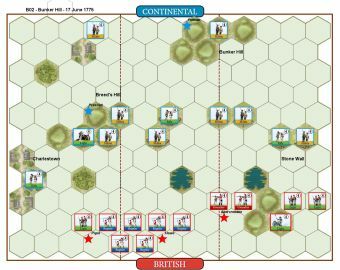 The Hessians Grenadiers put up some resistance but, isolated, they were blown apart by massed American muskets. 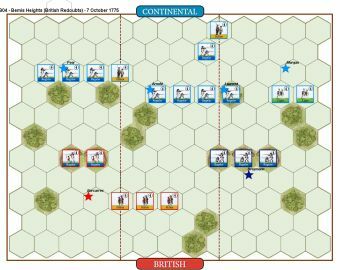 Then the British staged a comeback with the Americans getting cocky and sending in a Bayonet Charge. 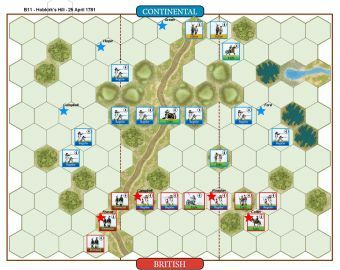 Unfortunately, for them, the British has 2 First Strike cards and routed all 3 American Regulars by scoring some hits and Flags, and the American units obligingly failing to roll a single Flag and routing off the board. 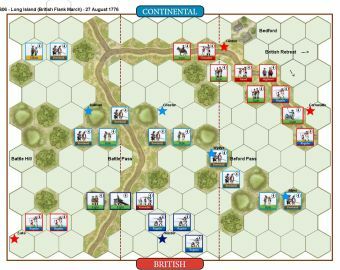 With their own Bayonet Charge the scattered British units came within an ace of victory, destroying 2 more American Regular Infantry units and following up into an isolated general, who survived. 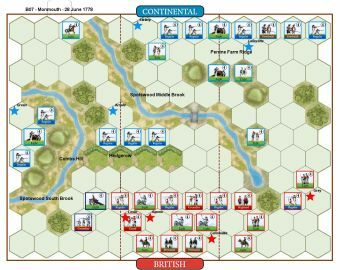 The lead British unit was, in turn broken and its general fled from the field giving the Americans victory. 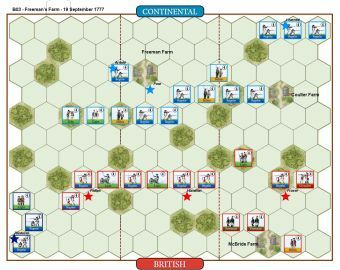 Game 2 saw the Americans suffer some heavy casualties in artillery and musket exchanges and the British passing their rout tests. 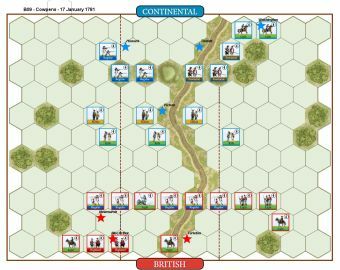 The Americans rallied their line twice and sent in a right flank attack which overwhelmed the Hessians Grenadiers, who took an American Regular Infantry unit with them and then fail utterly in the face of Hessian artillery with an attached general. 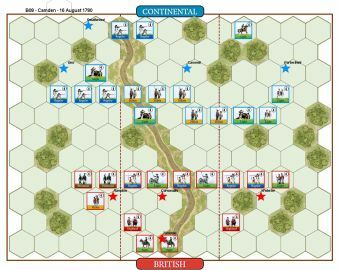 A British bayonet charge and line volley saw the Americans crumble and flee. Hats off General Fraser and his bayonet happy Light and Regular Infantry who cleared 3 enemy units and killed General Learned. 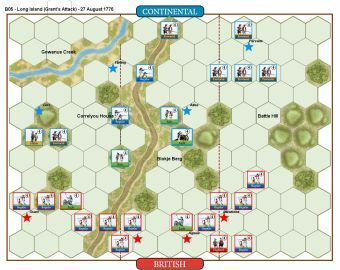 The Hessians and support artillery kept on inflicting hits and the Americans broke. 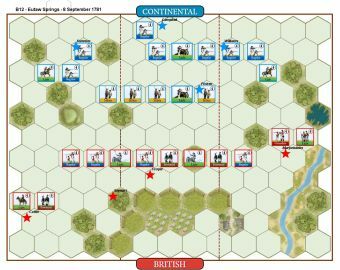 Burgoyne's successful pull-back of his last 2 Hessians units and the two weakened artillery units allowed them the break the exposed American right wing and yet stay safely away from the tree line. All Rights Reserved to respective owners © 2017. Website launched JANUARY 2018 by Alessandro Crespi. Commands and Colors: Tricorne - The American Revolution is a registered trademark of COMPASS GAMES LLC.